News and notes from the hockey world on this day, fifty years ago. The American Hockey League dropped the puck on their 1964-65 season last night with a pair of contests. 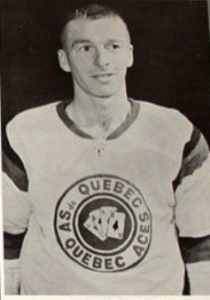 In Baltimore, the visiting Quebec Aces blanked the Baltimore Clippers 4-0, while in Providence, RI, the Reds doubled the Pittsburgh Hornets, 4-2. Bill Sutherland led the way for the Aces with a pair of goals. Keke Mortson and Guy Rousseau each scored once . Gump Worsley turned aside 29 Baltimore drives to record the shut out. Marcel Pelletier manned the nets for the Clippers. Yves Locas was the scoring hero for Providence in their win over Pittsburgh, scoring two goals. Len Ronson and Jimmy Bartlett rounded out the scoring for the Reds. The Western Hockey League also kicked off their season in Los Angeles, California. The Blades blasted the Victoria Maple Leafs by a score of 7-3. Brian Smith’s two goals topped the list of scorers for Los Angeles. In Montreal last night, the Quebec Provincial Police morality squad seized more than one million hockey pool tickets from a private home near Ville d’Auteuil. Two women and a man will be arraigned in court today. A gas explosion badly damaged the Dayton, Ohio arena yesterday. A maintenance man was injured but about a dozen other workers escaped unscathed. The building is a new arena which was slated to open on October 19. The damage is estimated at $300,000. Apparently the maintenance worker was drilling a hole when gas that had leaked from a furnace line ignited. The blast blew the man through the wall and part of the building’s room fell on him. His condition was unknown at press time. The NHL board of governors approved the awarding of two new trophies for the 1964-65 season yesterday. The Lester Patrick trophy will be awarded for outstanding service to hockey in the United States. All officers, coaches and executives of the four U.S. NHL clubs will be eligible. The Toronto Maple Leafs have donated the Conn Smythe Trophy to the National Hockey League, to be awarded to the outstanding player in the Stanley Cup playoffs each season. In addition to the hardware, the winning player will receive $1000. The governors will be the selection committee for the trophy, which will be awarded immediately following the deciding game of the final series. 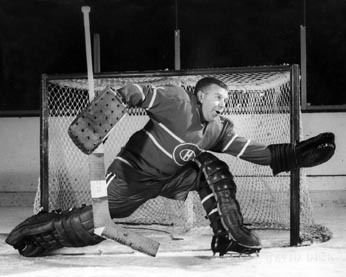 Going into training camp, it appeared that the Detroit Red Wings and Montreal Canadiens were finally going to consummate the long rumoured trade that would send goaltender Lorne (Gump) Worsley to the Wings. Both clubs apparently wanted to see the roly-poly netminder perform in camp before signing off on the deal. Worsley had a good camp, so Wings’ GM Sid Abel revisited talks with Sam Pollock, his Montreal counterpart in an effort to complete the transaction. Gump Worsley – won’t be going to Detroit, for now. 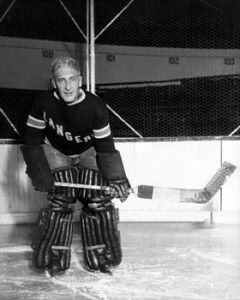 Pollock, however, decided against sending Worsley to the Motor City after watching last year’s first string goalie, Charlie Hodge, perform poorly throughout camp. So the deal was called off, assuring Pollock a viable Plan B if Hodge continues to struggle.